more than a new pro app, a smarter way to work! 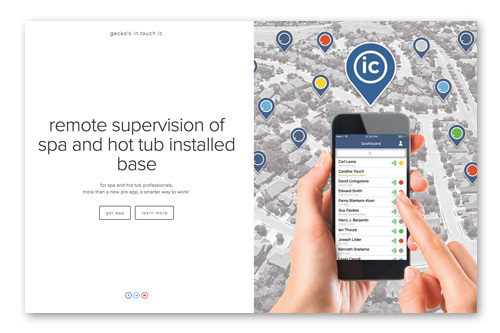 In just a few clicks on your smartphone, scan all connected spas and hot tubs of your installed base on your in.touch ic app dashboard. Color status codes and signal strength icons give you a real-time info on the status of each of them. Detect and correct customer problems even before they notice them or immediately access all pertinent info about their spas when customers call, for real professional and proactive technical service wherever you may be. From your smartphone (with in.touch ic) to theirs (with in.touch 2), you can ask customers permission to access their spas and quickly get the info you need to remotely identify, trouble shoot and resolve problems on their spas.